UBC Studies in the Ancient World is a monograph series publishing books about the culture and society of the ancient Mediterranean central to the Department’s interests (Egyptology; Near Eastern Studies; the Greek, Roman and Byzantine worlds), especially but not exclusively works by younger scholars. Titles published in the series, which was founded by Professor Wilson in 2006, are printed and distributed by Oxbow Books, Oxford, in the UK, and by Casemate Academic, Havertown PA, in the USA; but the books are edited, designed and typeset within the Department. All manuscripts are subject to peer review, and normally require a modest subsidy to support the costs of preparing them for publication. Two volumes have been published to date, and a third will be published in the summer of 2019. 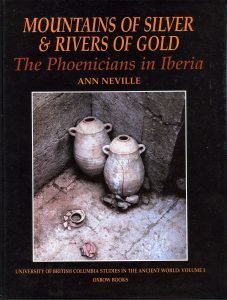 Ann Neville, Mountains of Silver and Rivers of Gold: The Phoenicians in Iberia, with a foreword by R. J. A. Wilson, 2007, pp. 240, with 90 black and white illustrations. Hardback. ISBN 978-1-84217-177-6. Out of print. The traditional picture of the Phoenicians in Iberia is that of wily traders drawn there by the irresistible lure of the fabulous mineral wealth of the El Dorado of the ancient world. However, a remarkable series of archaeological discoveries, starting in the 1960s, have transformed our understanding of the Phoenicians and allow us to glimpse a picture of life in the Far West that is far richer, and more complex, than the traditional mercantile hypothesis. Drawing on literary and archaeological sources, this book offers an in-depth analysis of the Phoenicians in Iberia: their settlements, material culture, contacts with the local people, and activities; agricultural and cultural, as well as commercial. It concludes that the Phoenician presence in Iberia gave rise to a truly western form of Phoenician culture, one that was enriched and drew from contacts with the local population, forming a characteristic identity, still visible on the arrival of the Romans in the Peninsula. Ann Neville holds a BA from the National University of Ireland at University College Dublin, and an MA and a PhD from the University of Dublin at Trinity College. Having taught at both University College Dublin and University College Galway, she now works as an Educational Development Officer in Dublin. Adorning the north-west staircase in the British Museum is a group of brightly-coloured figured mosaic pavements. Most were excavated for the Museum between 1856 and 1859 at Carthage, in what is now Tunisia, by a dilettante called Nathan Davis; the work was funded by the Foreign Office of the British Government. This book recounts for the first time the extraordinary story behind this pioneering enterprise, and the political and cultural rivalry between representatives of the colonial powers as they asserted their rights to explore the buried remains of the one of the ancient world’s greatest cities. 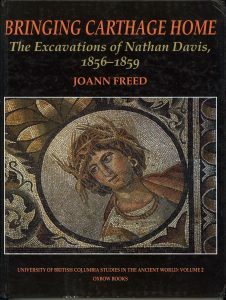 Using unpublished documentary material as well as what can be gleaned from published sources, including Davis’ own discursive and chaotic account of his work, Carthage and her Remains (1861), the author places Davis’ discoveries both in their wider archaeological context and in their topographical setting, locating for the first time on the ground the places where Davis sunk his trenches. The result is an important and original contribution to the history of archaeology, to the topography of Carthage, to the study of North African mosaics, and to social and political intrigue in mid-nineteenth-century Tunisia. Joann Freed is Professor Emerita in the Department of Archaeology and Classical Studies at Wilfrid Laurier University, Waterloo (Ontario), Canada, where she taught between 1989 and her retirement in 2009. This volume investigates the interaction between the natural environment, market forces and political entities in an ancient Sicilian town and its surrounding micro-region over the time-span of a thousand years. Focusing on the ancient polis of Kale Akte (Caronia) and the surrounding Nebrodi area on the north coast of Sicily, the book examines the city’s archaeology and history from a broad geographical and cultural viewpoint, suggesting that Kale Akte may have had a greater economic importance for Sicily and the wider Mediterranean world than its size and lowly political status would suggest. It also includes a comprehensive analysis of the 1999–2004 excavations at Caronia Marina and its material, one of the few detailed publications from Sicily of Hellenistic and Roman amphorae. 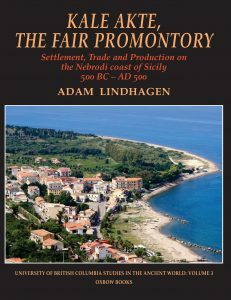 The study offers a fresh perspective of the economic history of ancient Sicily, and concludes that Kale Akte’s privileged location on the north coast was well suited for the export trade to Italy and the city of Rome itself, which enabled the Sicilian town to prosper during the Roman Empire. The origins of Kale Akte and its alleged foundation by the exiled Sikel leader, Ducetius, in the fifth century BC, are also discussed in the light of the latest archaeological discoveries. Adam Lindhagen, who received his PhD from Lund University in 2007, has conducted excavations in Sicily, Bosnia-Herzogovena and Italy, and published extensively on ancient Sicily and Dalmatia. He has held postdoctoral research fellowships at the Universities of Stockholm and Uppsala, and is now a specialist in legal aspects of the cultural heritage, including the destruction of cultural property in the context of international law.